Vintage Canvas Flight Bag | BUDK.com - Knives & Swords At The Lowest Prices! This military-grade GI-style Vintage Canvas Flight Bag is perfect for travel, especially flying! Don't be fooled by other fake-looking military bags—this flight bag is the real deal. 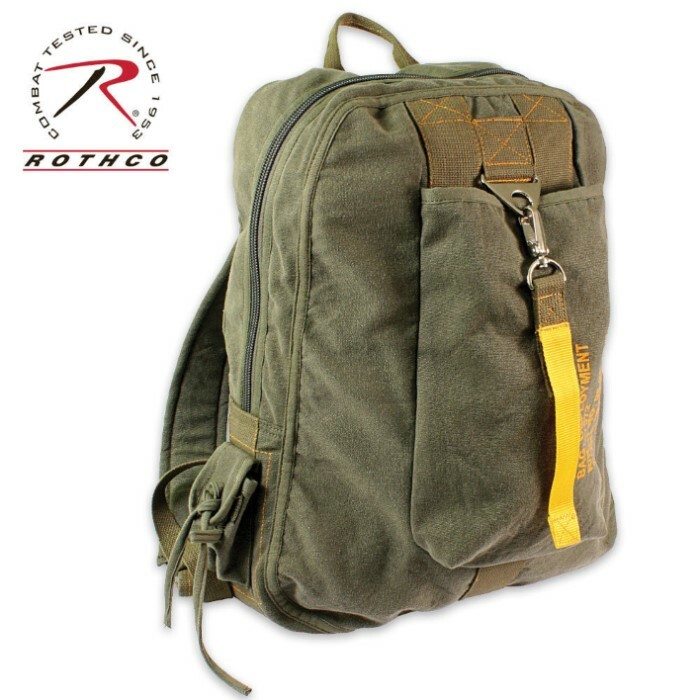 This durable flight bag is crafted of soft, washed cotton canvas, and features a large main compartment for tons of storage with an inside zippered pocket for organization, a small side pocket with a hook and loop closure, a front pocket with metal claps closure and strap, and adjustable padded shoulder straps and a top carry handle for added convenience. Measures 19.5" x 15" x 4.5." The bag looks great. I got the black and the contrast stitching really makes it pop. The canvas is very soft and thin, I would not trust this bag to hold up to any outdoor abuse. Would make a great overnight bag if visiting a friends, or any other light load and light abuse task. I would not recommend as a school or book bag as I am pretty sure any hard edges would shortly spell doom for the material. Used for cosplay, props, and the like would be excellent also it could be a great base to star a DIY project. Just came in right on time. Bigger than i thought it would be so loving the space. My only complaint is it didn't come pack full of free goodies XD lol It almost matches my map satchel i got a while back so will make a great combo.